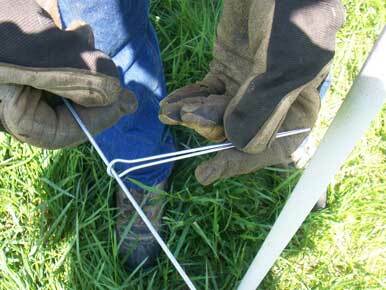 PasturePro cotter pins are used to attach the wire to line posts. These galvanized steel cotter pins are a simple and economical solution for wire attachment. The Right Size, Every Time. With PasturePro cotter pins, you simply field-drill a hole in the post, insert the pin and wrap it by hand. The self-insulating line post takes care of the rest. PasturePro cotter pins are 3-4 times less expensive than plastic t-post insulators. And when used on the self-insulating PasturePro line post, they cannot short out your fence like cracked insulators do on t-posts. Give us a call at 1-800-563-6771 M-F 8:30am-4:30pm CT, submit your question to the contact form.